Thanks to the Research task pane in Word 2016, your desk needn’t be as crowded as before. 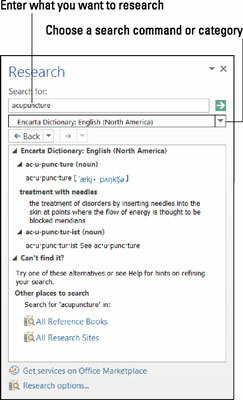 The Research task pane offers dictionaries, foreign language dictionaries, a thesaurus, language translators, and encyclopedias, as well as Internet searching, all available from inside Word (and the other Office programs too). As shown here, the Research task pane can save you a trip to the library. The Research task pane is like a mini reference library. Either click in a word or select the words that you want to research. For example, if you want to translate a word, click it. Clicking a word or selecting words saves you the trouble of entering words in the Search For text box, but if no word in your document describes what you want to research, don’t worry about it. You can enter the subject of your search later. The Research task pane appears. If you’ve researched since you started running Word, the options you chose for your last research project appear in the task pane. Enter a research term in the Search For text box (if one isn’t there already). Open the Search For drop-down list and tell Word where to steer your search. Choose a reference book or research website. Click the Start Searching button (or press Enter). The results of your search appear in the Research task pane. If your search yields nothing worthwhile or nothing at all, scroll to the bottom of the task pane and try the All Reference Books or All Research Sites link. The first link searches all reference books — the dictionaries, thesauruses, and translation service. The second searches research sites — Bing, Factiva iWorks, and HighBeam Research. You can retrace a search by clicking the Back button or Forward button in the Research task pane. These buttons work like the Back and Forward buttons in a web browser.